I’m self-publishing, and designing the interior of my book myself. 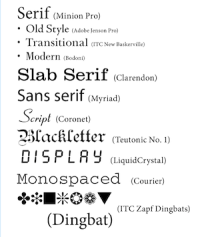 Several people have recommended typefaces like Sabon or Janson, but I’m not sure how to go about deciding which to use. I’m also not sure about which font size works best. Can you help? There are thousands of typefaces, but you don’t need to sort through them all. Sabon and Janson are popular typefaces for books because they’re easy to read. So are Caslon and Goudy. Here’s a downloadable PDF that shows those four popular typefaces in various font sizes, to give you an idea of how the typefaces compare with one another, and how much text fits on a typical page in various sizes. Choose a typeface that’s specifically designed for extended reading; it will be much easier on the eye in long blocks of text (like books). Choose a face with a tall x-height; compare the heights of the lower case “c” and “e” in Sabon and Janson, for example. They’re easier to differentiate in Janson. Then compare the lower case “a” in those same two faces. The Sabon “a” is more open, and easier to read, while the Janson “a” looks a little squished. Start by looking at an 11 point font in whichever typeface you want to use. Then go up or down half a point to see what it looks like in a slightly larger or smaller size. For best readability, use a line height one or two sizes greater than your font size. (For example, Sabon 11/13, where 11 is the font size and 13 is the line height). Even in “safe” fonts like these, you’ll see some differences in letterforms, which, although they’re subtle, can have a significant effect on readability in large blocks of text. The distinctive “r” in Caslon and and “t” in Goudy are also hard to read. Next post: Paperback Books—Does Size Matter?